Volunteers needed for the Guild’s Booth! The Guild will participate in the Home and Hobby section of the Del Mar Fair again this summer. The confusion of last year seems to have been resolved and we have been promised a booth like we had before (YAY!) As in the past, volunteers will receive a free one day Fair entry pass and will have lots of fun greeting attendees, demonstrating knitting, and talking about our Guild. Dates and Time. In order to have a booth, we needed to commit to five days, and daily times will be 11 am to 4 pm. I have requested June 19, 20, 21, 22 and 23 as our dates and am awaiting confirmation on this. I would like to have three or four members at each shift so we can take turns wandering around, take a lunch break, etc. Sign ups. 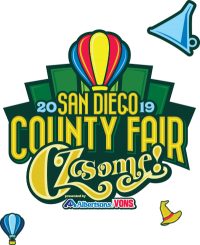 If you can volunteer this year, sign up on my clipboard at the April meeting, or email me anytime at CountyFair@SanDiegoKnitters.com. We can arrange shifts for your convenience and to be with a friend. Parking.The fair plans to charge for parking at the Horse Park this year. Free shuttles from local schools will be available, but school lots are not available every day. Check the Fair website for details and updates. We will get one free parking pass per day so carpooling will help. Logistics will be ironed out later. Late Breaking News – the Fair has just announced dates for submission to Home and Hobby. Details can be found on the Fair Website here. « 2019 Guild Knitters Retreats – A Wait List is Possible for the August Retreat!